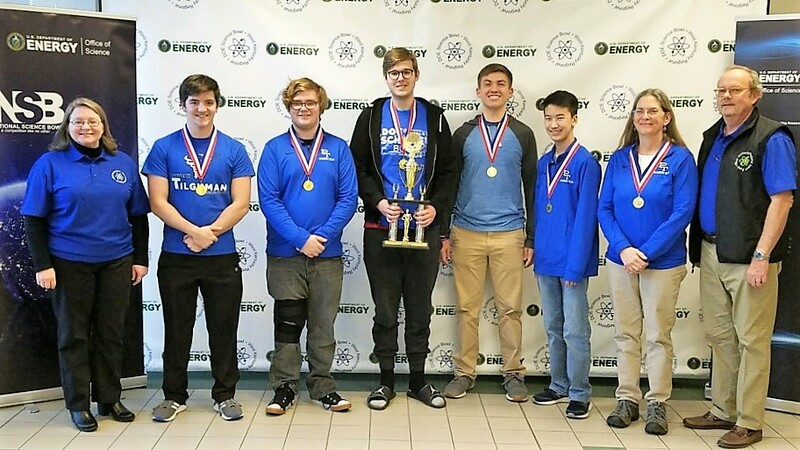 Congratulations to the PTHS Science Bowl Team, which placed third overall out of 17 teams at the US Department of Energy's regional Science Bowl competition. Members include (pictured left to right) Samuel Lambert, Travis Trimble, Austin Yarbrough, Lance Butler, and Ryan Chua. The team is coached by Mrs. Chris Wynne. Pictured with the team are Mrs. Jennifer Woodard and Mr. Buzz Smith from the Department of Energy Paducah Site.